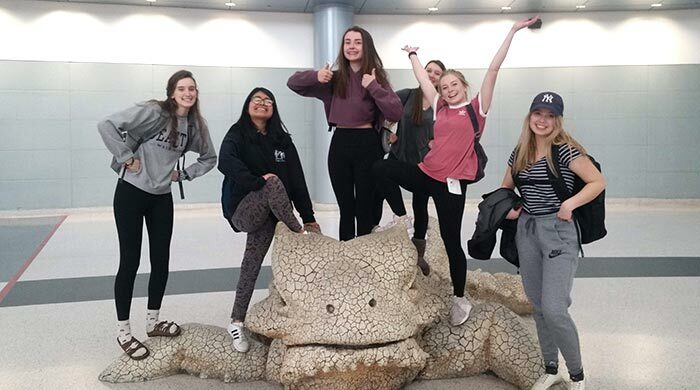 Six student members of the Sisters community RECON team recently returned from the 2019 network-wide conference held in Boulder City, Nevada, with renewed enthusiasm and dedication to carrying forward the goals of the program. Led by high school teacher Rima Givot, Joelle Asson, Amy Hills, Delsie McCrystal, Paola Mendoza, Ramsey Schar and Holly Werts learned about what sorts of changes are in store to help improve the overall success of the project. RECON is an acronym that stands for Research Education Collaborative Occultation Network — a citizens science project that investigates small, icy bodies in the outer reaches of our solar system. The Sisters team is one of 65 similar communities positioned along the eastern spine of the Cascade and Sierra Nevada Mountains, from British Columbia to Arizona, that are equipped with the tools (telescopes, cameras and laptop computers) necessary to help measure the size and shape of Trans-Neptunian Objects (TNOs) using the method of stellar occultation. An occultation occurs when a nearby object moves in front of a star, causing the star to temporarily “wink out.” The length of time between the star’s disappearance and its reappearance is proportional to the size of the obscuring body. Held on the weekend of February 28 through March 3 this year, the RECON conference had a few goals it wanted to achieve. Some of these included discussing upcoming events and plans, sharing of information among other communities, comparing their success and setbacks, identifying strategies for recruitment and retention of team members, and training new team members and practicing for future events. Of particular interest for many were the newest pictures that the New Horizons spacecraft took of asteroid Ultima Thule, the farthest body to be imaged close up thus far. The pictures of the asteroid clearly show that this is a contact binary asteroid—two objects that became stuck together, probably millions or even billions of years ago. New Horizons is the spacecraft that obtained the fantastically detailed photos of Pluto in 2015. But what generated the most excitement was the news that each participating community may be getting a new “smart” camera, the HyperStar, which will allow the telescope to be operated robotically. It will also provide a much wider field of view, making it easier to find objects in the sky. “Traveling and making memories with my classmates was fun for me,” said Schar. She also enjoyed the talks by RECON leaders Mark Buie and John Keller. All the girls are looking forward to learning how to use the new camera when it is distributed to the member communities. “Then we’ll be able to take our own pictures to use with future Nugget articles,” said Schar. RECON is funded by the National Science Foundation.